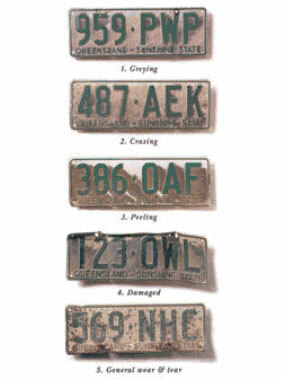 If you drive on Queensland roads, your vehicle must be fitted with official number plates. If your vehicle is issued with 2 plates, both must be attached to the vehicle. It is important to note that any number plate issued to a vehicle, that includes personalised or customised plates, remains the property of the State of Queensland and must be surrendered to the Department of Transport and Main Roads, if required. For personalised and customised plates, it is the number plate combination that is the property of the person to whom the plate is issued, not the physical number plate. Find out more information about cancelling your vehicle’s registration. It is your responsibility to make sure your number plates are kept in good condition and are clearly legible from any position from which they are required to be visible. if plates are not altered in any way so as to damage or deface the plate. Drilling holes in a plate to attach a reversing camera is not permitted. A cover, which includes a frame, must allow for clear space around the plate details and not sit flush to any details, which includes the plate number and the registering state or territory. Legible number plates are essential to ensure accurate identification of vehicles and this is based on a community need to trace stolen vehicles and those vehicles involved in crime and traffic incidents such as red light and speed camera offences. You can be fined if your plate details are not clear due to a drilled hole, cover or a frame or for not replacing damaged or illegible number plates. The characters on a number plate must be visible from 20m away at any point within an arc of 45 degrees from the surface of the plate, above or to either side of the vehicle. Plates must also be not more than 1.3m above ground level. This is shown in the diagrams below. Over time, excessive exposure to exhaust fumes, chemicals, stones, the sun, and general wear and tear can damage your plates and make them hard to read. You should check the condition of your plates regularly, particularly if you have older plates. Normal (standard) number plates have a 10 year guarantee against faulty material and workmanship. This warranty period only applies when a vehicle is being used under normal conditions. For warranty information for normal number plates, contact the department or go to a transport and motoring customer service centre or, if you live in a rural area, a QGAP office, Magistrates Court or local police station that provides vehicle registration services—please call to confirm before visiting. Police and transport inspectors regularly check the condition of number plates. Make sure your plates can be read. If they cannot be read and cleaning does not fix the problem, you will need to replace them. If your plates have been damaged, destroyed or stolen, you are required by law to apply for replacement plates within 14 days. To replace your plates, whether you are replacing normal (standard) number plates, personalised or customised plates you can visit a transport and motoring customer service centre or, if you live in a rural area, a QGAP office, Magistrates Court or local police station that provides vehicle registration services—please call to confirm before visiting. if a personalised or customised plates are in 2 names they must both sign the application and both provide identification. check PPQ for the fee cost of a personalised plate. When you hand your form in, you will need to hand over your old plates as well. If you cannot hand over your plates (because they were lost, stolen or destroyed), you will need to explain on the form what happened to them. If you are getting replacement plates that are not customised or personalised, you will get them immediately. You will get a new number plate combination. You must attach number plates within 1 day of receiving them. We encourage you to attach the new plates to your vehicle before you drive away. If you are applying for the same plate number (these are known as customised plates) or personalised plates, your new plates will be ordered and mailed to you. You need to keep the old plate on the rear of your vehicle until you receive your new plates. For a vehicle with 2 plates, keep the plate that is in the best condition on the rear of your vehicle. You must hand in the old plate when the new plates arrive. If your standard number plates have been cloned, we will replace them free of charge. Cloned plates are illegal copies of your number plates that use your number and letter combination to avoid infringements. If you suspect your number plate combination has been duplicated and used in illegal activity contact Queensland Police and obtain a report stating you have been the victim of a cloned plate offence. your number plates (remove them after you arrive at the customer service centre). Information about attaching personalised number plates to your vehicle is available on the PPQ website. If you have a tow bar on your vehicle that blocks the view of your rear number plate, remove it when you’re not using it. If your vehicle’s tray is in the way, move your number plate to where it can be seen easily. A registered trailer is allowed to block the view of your vehicle’s number plates if the trailer’s plates are visible. If a bicycle rack or other accessory blocks the view of your number plate, you will need to order an accessory plate. An accessory plate is attached to a bike rack for example, to make your registration number visible from the required distance. Find out more about the requirements for attaching vehicle accessories and equipment (PDF, 416KB), such as tow bar mounted bicycle and wheelchair carrying racks. Before you can order an accessory plate your plate number must be customised so that the accessory plate can be linked to your registration number. in person at a transport and motoring customer service centre. accessory plate for your personalised plate—check PPQ for the fee cost. you want to get a plate number that was issued in the past but is no longer in use (retro/previously issued plates). Customised plates will become standard number plates if attached to a vehicle when transferred. You can’t sell a customised plate as ownership is not transferable. If you are using an unregistered vehicle permit to move an unregistered vehicle on the road, you must remove the number plates. If you move to Queensland from interstate, you will need to re-register your vehicle with Queensland number plates. Find out more about the National Heavy Vehicle Registration Scheme and national heavy vehicle number plates that begins 1 July 2018 in Queensland.